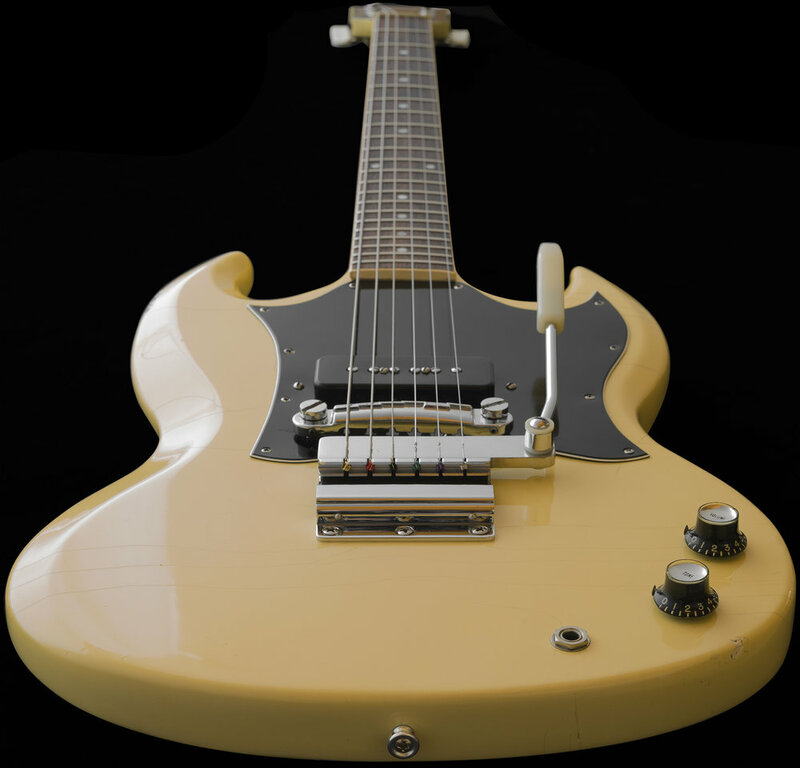 The SG "Junior" was Gibson's version of a more affordable SG model guitar. 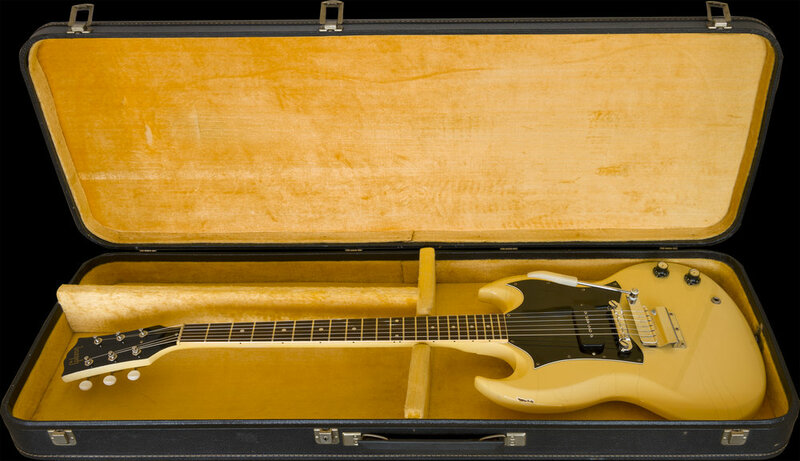 The plan seems to have worked as they produced quite a lot of these since the Thin, contoured-bodied SG models debuted sometime in 1960. In 1967, there was a total of 1144 Juniors produced, but only about 10% of them were finished in the optional WHITE, making this a much rarer variety. 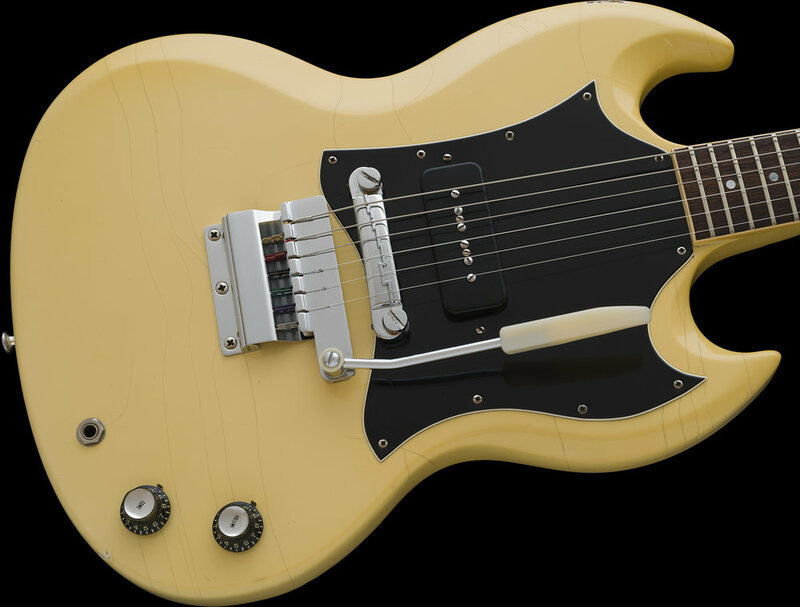 During this production period, the Junior models were generally all fitted with Gibson's short Vibrola Units, which was intended to make them more fun and attractive to buyers as Tremolo was still an exciting guitar feature! This era SG has a 1-piece Mahogany neck construction and the nut width on this particular example is slightly wider than the expected 1 9/16" as well as sporting the nicer looking, early style knobs. These changed to the "witch-hat" knobs shortly after this guitar was built. I have examined, tested, serviced and set-up this instrument and found it to be original and factory-correct with the lone exception of the Tuners. Most of the SG Juniors from this period had the lower end, stamped strip tuners installed at the factory. 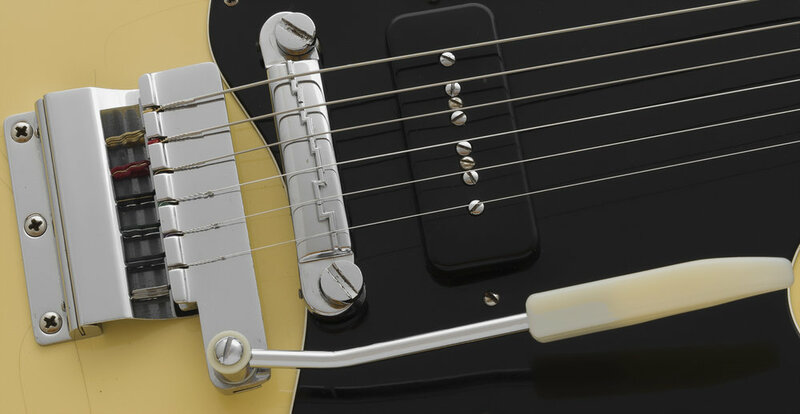 Because of the affordable lower price point of the model, Gibson elected to cut corners and used a cheaper set of imported, no-name strip tuners on these guitars. 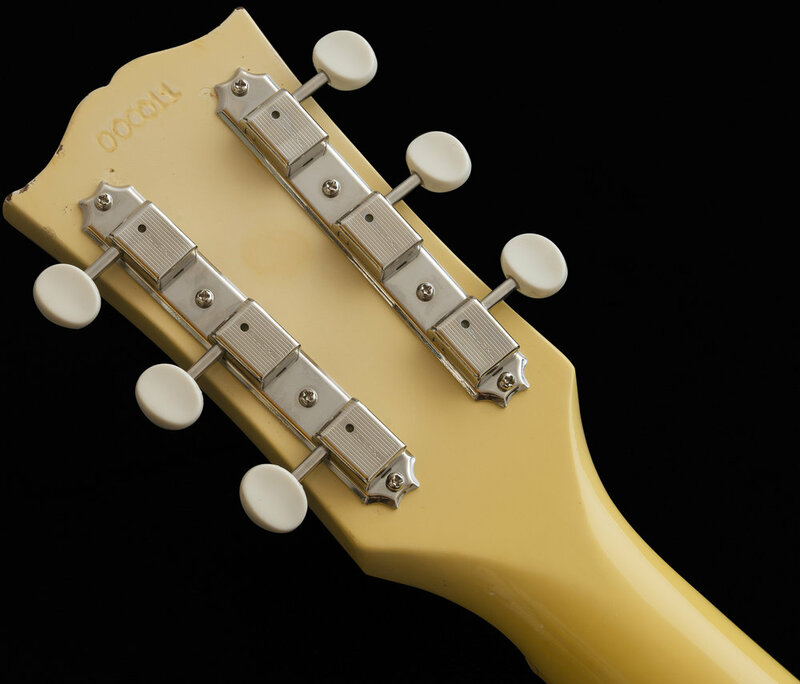 If you look at my close up photo of the back of the headstock, you can see the outline of the former set of tuners. The Kluson style replacements align and retrofit easily, but utilize a different screw pattern. None are visible, but there are 6 small mounting holes that are unseen under the tuner plates. The plus is that the upgraded tuners look and perform much better. I am also including the Original set of tuners which were in the case should anyone want to restore them, you have the option. 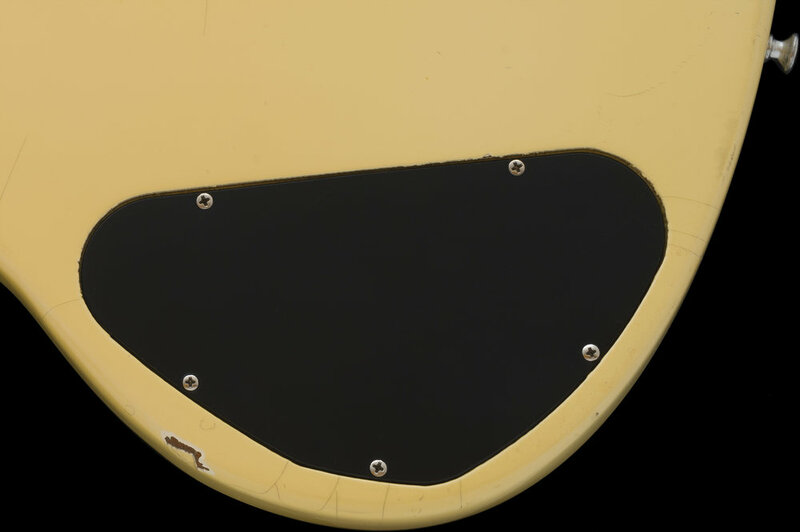 Additionally, all of the electronics, frets, nut, finish and both the plastic and chrome plated metal hardware are correct and original to the guitar. 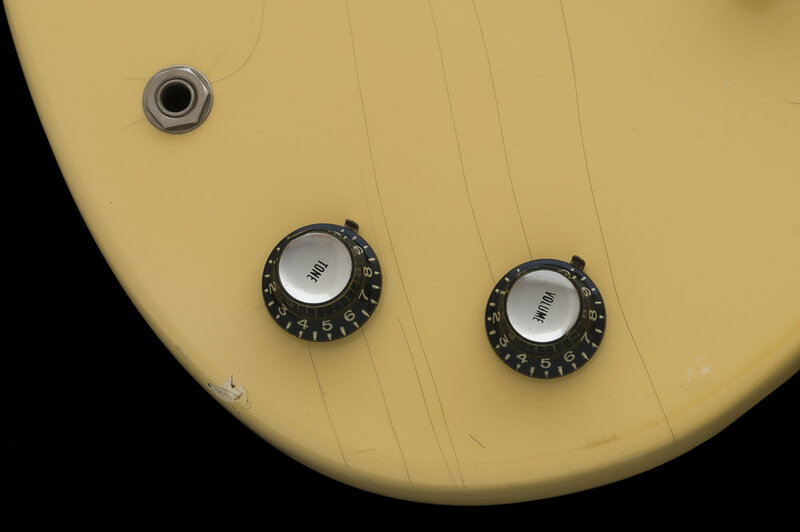 The potentiometers are matched and dated the 31st week of 1966, just slightly ahead of and correct for the early 1967 production and low serial number. The guitar shows exceptionally well and remains very attractive as my large and clear photographs demonstrate. The top clear-coat finish has naturally aged over time and has nicely yellowed and has also developed some normal, yet minimal "checking" that all contribute to its overall inviting, vintage patina. The playing and contact wear is minimal. Globally, there are several small dings, chips and tiny dents that have resulted from the guitar being sparingly used long ago. The frets remain in excellent condition. The CASE is the factory-issued original "OBLONG" hard shell, featuring Black Tolex with Gold lining and is also in excellent condition with a functioning handle, latches, and hinges. I acquired this guitar long ago while running my store. I remember it came in on a trade and because of it's vibe, I decided to hold onto it for a while, well, that was 25 years ago. I must've really liked it, and I still do. This vintage SG is now 51 years old and has been safely stored since I acquired it and has been spared all of the "circulation" that most instruments being offered online today have undergone. 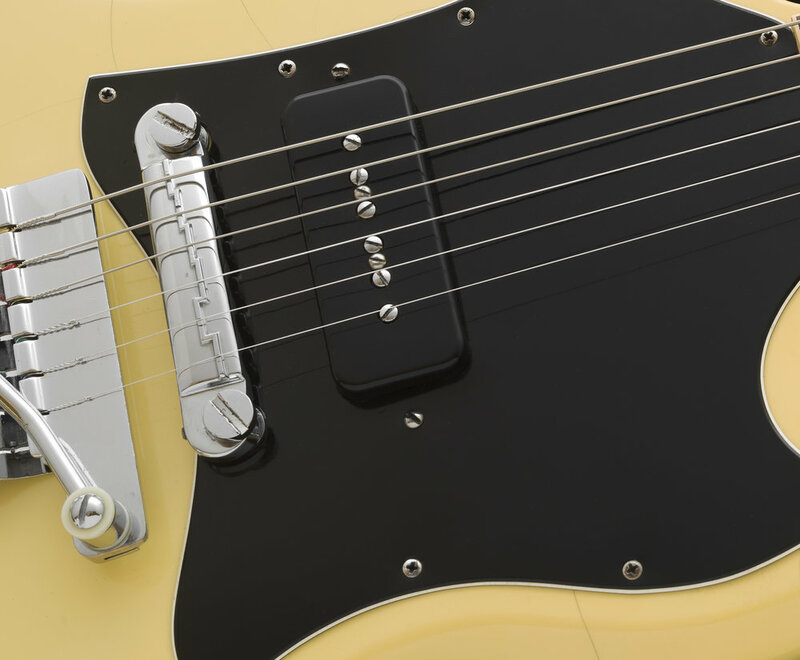 These are lightweight, fun and affordable Vintage guitars to play or collect. If you want an uncirculated example, this one may appeal to you too. Please inquire.